Now phones like Galaxy S5 has a fingerprint scanner which looks very cool, but at the same time it also costs too high. 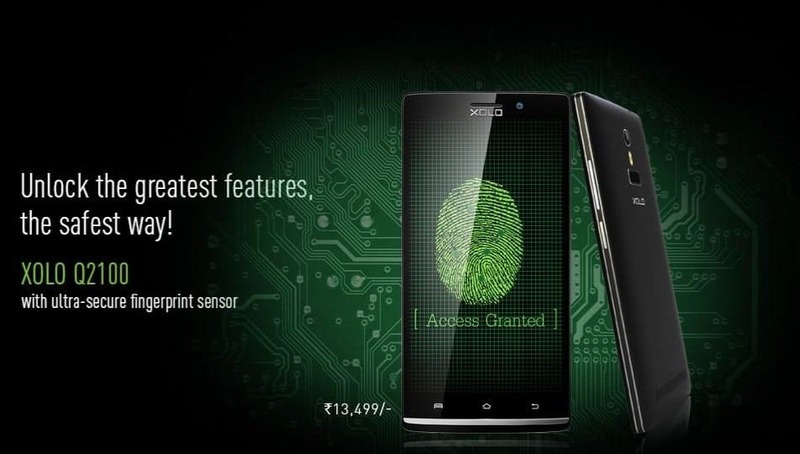 So if you are planning to buy a smartphone with a built-in fingerprint scanner, Xolo Q2100 with fingerprint scanner is the answer. The phone has been launched in India at Rs. 13499 and the main highlights of the Xolo Q2100 is the built-in fingerprint scanner at the rear, and an IR blaster that is capable of functioning as a universal remote along with the preloaded Peel Smart Remote app. The Smart Remote app can also control DVR, DVD player and air conditioners. The dual-SIM (3G+2G) Xolo Q2100 runs Android 4.4 KitKat and features a 5.5-inch HD (720×1280 pixels) IPS display with Corning Gorilla Glass 3 protection, and offers a pixel density of 267ppi. The Q2100 is powered by a 1.3GHz quad-core MediaTek MT6582 chipset coupled with 1GB RAM. The smartphone boasts of an 8-megapixel autofocus snapper with SonyExmor R sensor and dual LED flash, also there is a 2-megapixel front-facing camera for video calling. The phone has 8 GB of in-built storage, which can be further expanded upto 32 GB via microSD. Connectivity options on the Xolo Q2100 include Bluetooth, Wi-Fi 802.11 b/g/n, USB OTG, A-GPS, and FM radio. In case of sensors, the phone has an ambient light sensor, accelerometer, magnetometer, and proximity sensor. It packs a 2800mAh battery, which is rated up to 27 hours of talk time on 2G and 22 hours of talk time on 3G network. Read the full specifications of Xolo Q2100. This phone will be competing against its rivals like Canvas Nitro and Moto G 2nd Gen, the next generation of Moto G from Motorola. Next articleiPhone 6: Main Disadvantage of iPhone 6 and why Apple failed?